I love sprouting. Sprouts are an easy and quick way to get fresh greens in your diet no matter what season it is! Plus growing your own gets you sprouts at a fraction of the cost of buying sprouts at the store. Before seeds sprout they are dormant little plants. Sprouting changes the chemistry of the seed and adds vitamins and nutrients that weren’t there before. Sprouts require no soil and very little space to grow. You can grow fresh, nutritious foods with no garden plot. This is especially great if you have a small yard, or live in an apartment or rental house. 1. Sprouting seeds. You can get these at your local health food store or online. You don’t want to use garden grade seed as it may have been treated and isn’t meant to be consumed before it’s grown into a mature plant. 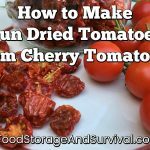 So make sure your seeds are produced for sprouting and not just scooped out of the bulk bin at your local garden center. 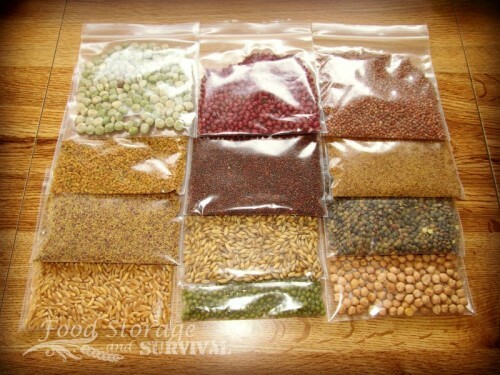 Sprouting seeds come in two basic categories: vegetable seeds (like alfalfa, radish, clover, broccoli, fenugreek, etc.) and legumes/grains (chickpeas, mung beans, wheat, kamut, lentils, etc.). In general, the vegetable varieties will take a little longer to grow because those are the ones you want to grow long and leaf out. The legumes/grains can be ready to eat within a couple of days as they are most often sprouted just until the “tail” starts to show although some times are sprouted longer (like bean sprouts for stir fry or growing wheatgrass). 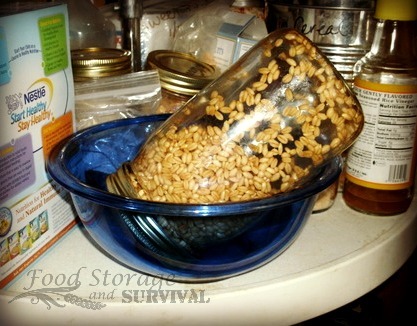 You can also sprout some nuts like sunflower seed, hazelnuts, and almonds. You don’t want to sprout tomato, potato, paprika, aubergine, eggplant, or rhubarb as they can be poisonous. Stick with a good supplier of sprouting seeds and this won’t be an issue. Here’s a nice variety pack to get you started! 2. A sprouter. There are many varieties and brands of sprouters, but they generally fall within a few different “types”. Tray sprouters are great for sprouting anything really, but are particularly nice for the long sprouts like alfalfa, fenugreek, and clover, as the tray configuration lets them grow nice and straight and pretty. There are a lot of different tray sprouters on the market. Look for one that you can do more than one batch in so you can have sprouts maturing at different times and don’t have to wait for your first batch to finish (which can take up to a week) before starting a second batch. I use the Sprout Master trays and love them. Jar sprouters are as simple and inexpensive as they come. These can be as easy to acquire as pulling out a quart mason jar from your storage and strapping some type of mesh over the top (fabric, screening, etc.). There are companies that make mesh strainer lids and some that make a whole sprouting jar setup. I just use a jar with some fiberglass screen material from the hardware store over the opening. Cheap and easy. You can grow any kind of sprout in the jar, but I find I want to rinse more often as they don’t get quite as good of air circulation as the tray sprouters. Hemp bag sprouters are something I’ve just recently run across. The idea with a hemp sprout bag is that the sprouts are kept moist by the fabric as they grow inside the bag. 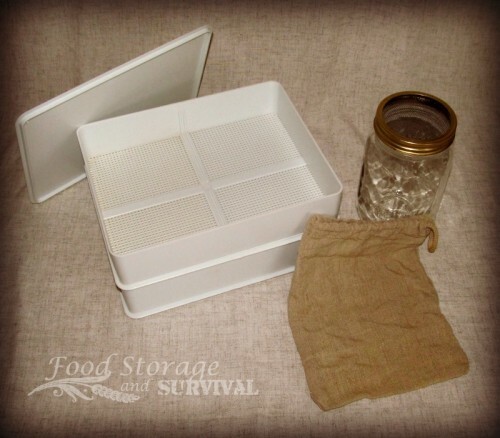 They are easy to use (see how I sprouted mung beans in one here) and can store very compactly when not in use. 3. Water. The water from your tap is fine. If you want to use filtered or other special water, go ahead. I just use the water from my sink. You’ll need to give your sprouts a rinsing at least twice a day. That’s it. Seeds, a sprouter, and some water. Simple. 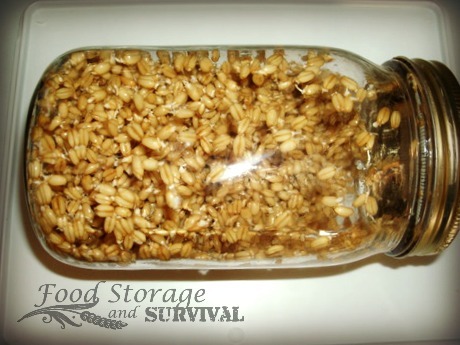 For our demonstration, I’m sprouting wheat in a jar sprouter, but the steps are the same no matter what you are sprouting. Check out these posts to see specifics for a tray sprouter or a bag sprouter. 1. 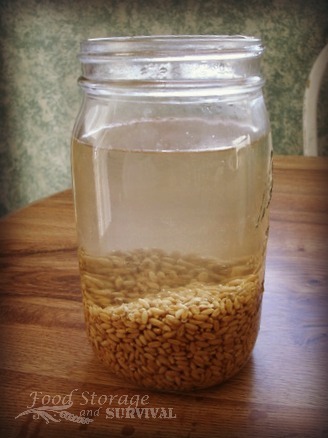 Soak your seeds in water 6-8 hours in a jar or bowl with three times as much water as seeds. Some seeds soak up more than others, so make sure there is plenty of water covering your seeds. 2. Drain the soak water and put the seeds in the sprouter. 3. Rinse and drain the seeds again before putting them away. 4. Put your sprouter in a dark place where you will not forget about it. I like to put mine in a kitchen cupboard that I frequently open for meals. 5. Rinse and drain the sprouts two to four times a day to keep them moist and clean. If you forget and they dry out a bit, just get them nice and wet and let them try growing again and usually they’ll just pick up where they left off. 6. Allow the sprouts to grow to the desired length. Vegetable sprouts will usually take 5 to 8 days, and legumes/grains can be ready to eat when they just have a tail sprouting—usually within 24 to 48 hours. Test the sprouts along the way and see at which stage you like them best. 7. To turn sprouts green, allow them to sit in the sun 4-6 hours after the leaves have grown (this step is only necessary for “green” sprouts like alfalfa, radish, and clover). 8. Store in the refrigerator for up to a week (mine almost never last that long—too many snackers! ). 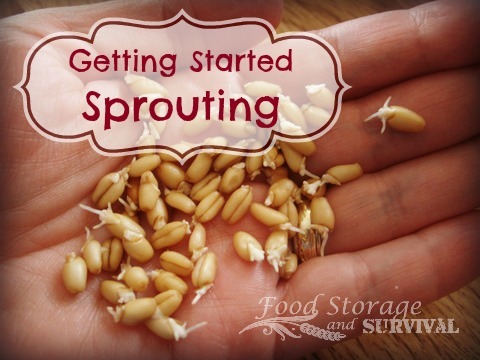 Usually the sprouter makes an excellent crisper, so if you don’t need it to start more seeds you can refrigerate the sprouts in the sprouter they grew in. Now go get sprouting! The products below I have personally used and recommend for sprouting! Great information! It was nice to see you at the Preparedness fair yesterday.